I have decided to reinstate this feature. The weather is gray and depressing and it looks like it will be raining all weekend, so a little baseball cheer is needed. Plus, until Spring Training gets truly underway, it might be the only way I can maintain this space. To the photos! This one was actually taken yesterday afternoon on my way to the car after work. 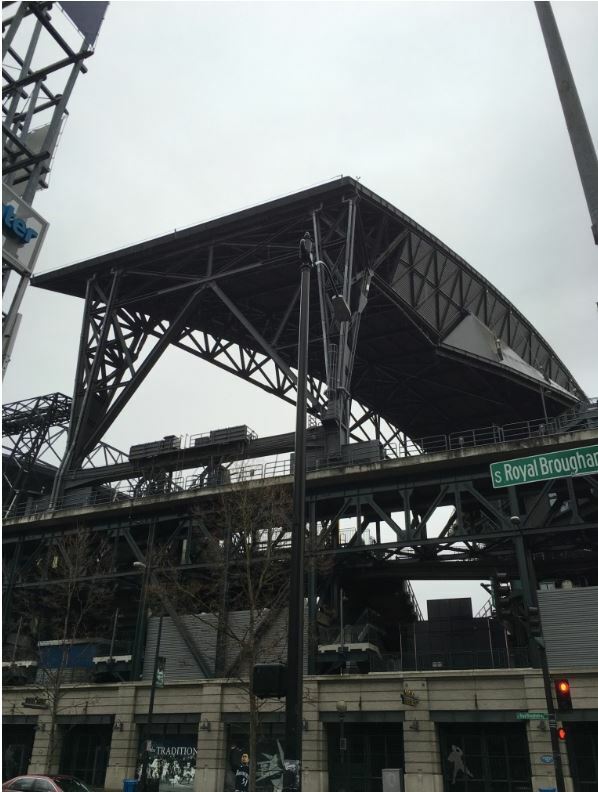 It’s not often that you see the roof split up into its multiple pieces. Yesterday was such a day. I also saw someone walking along the rails a bit before he disappeared down the ramp to the Terrace Club. I can only assume they’re getting things ready for the start of the season; because you know it will probably be raining on Opening Day. 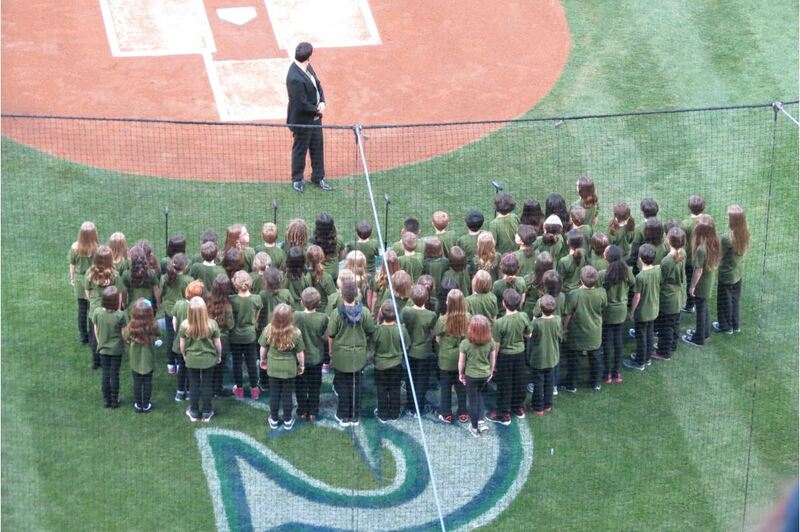 A children’s choir gets ready to sing the National Anthem prior to a game last year. I don’t remember which game it was, but I vaguely remember that it was not a game in my plan (because I sat in left field last year), and that I was there for that specific game (might have been fireworks or a certain giveaway). I also remember this particular Anthem being very cute. One of the many variations that we get at the park yearly. 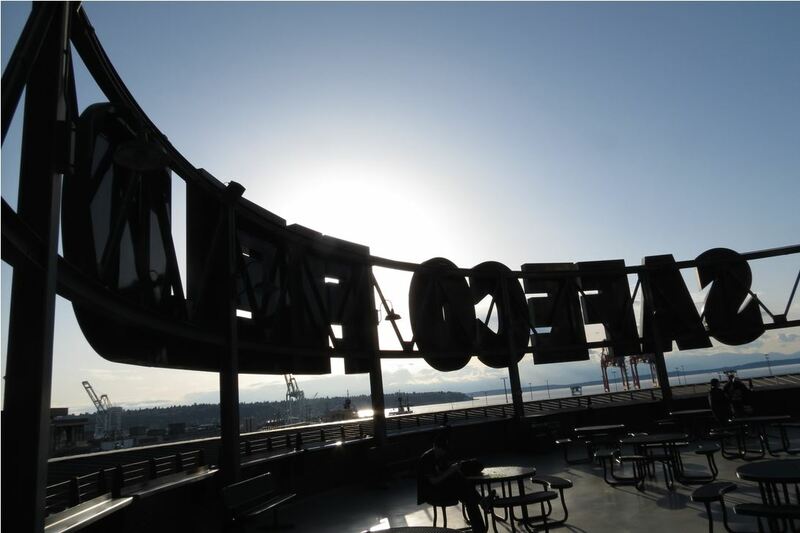 Finally, a windy but warm day in the upper deck. Probably earlier in the year, judging by the snow on the Olympics in the background. Maybe May or early June. This photo gets taken a lot by fans and the organization alike, but it’s an amazing view, isn’t it? It’s best when the sun is going down in the west, super low in a pink and orange sky. We have another week yet before pitchers and catchers report, but baseball really can’t start soon enough. It’s been a rough, dark, wet winter, and from what I understand, today’s black skies and rain are going to extend into the weekend. Like many others I’m sure, I’ve been spending my days dreaming of green grass, warm winds, hot dogs and beer, longing for the months where the days are longer and the game is back. Only 55 mor days! Well done as usual. Makes me want to become a ticket holder. love ya. Nice post Megan. Can’t wait for Opening Day!